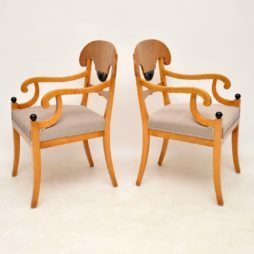 Antique Chairs | Interior Boutiques – Antiques for sale and mid century modern furniture, french furniture, antique lighting, retro furniture and danish furniture. 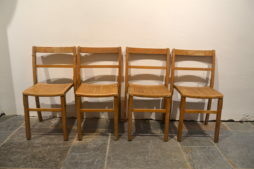 1930s school stacking chairs in nice original condition. 10 available. 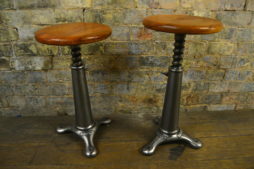 Ideal for residential and commercial use. 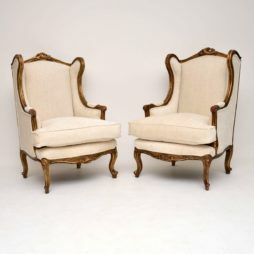 Fabulous pair of antique fully upholstered armchairs with rosewood legs that have applied gilt bronze mounts. 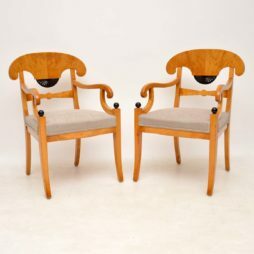 They are wonderful quality & still have the original crisp horse hair beneath the fabric, which must have been redone quite recently judging from the good condition. 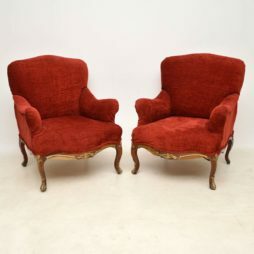 These are also very comfortable armchairs with generous proportions & a great all round shape. 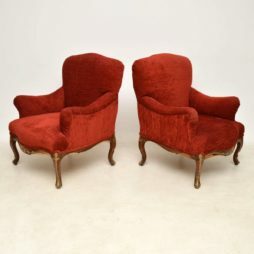 They look to me early Victorian or William IV period & I think they are English or possibly French. Please enlarge all the images. You will notice that there is a bit of ormolu missing in a couple of places on the back legs & there is a very small piece of wood missing on the edge of one of the back legs which is hardly noticeable. 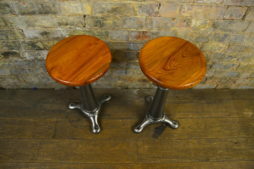 These chairs have come straight out of a London residence & we haven’t done anything to them, because they are structurally sound. It might be a little bit hard to have the missing ormolu replaced, although anything can be done for a price. Personally, I would leave the back mounts alone. Or, they could just be taken off the back legs, so no-one will be any the wiser. 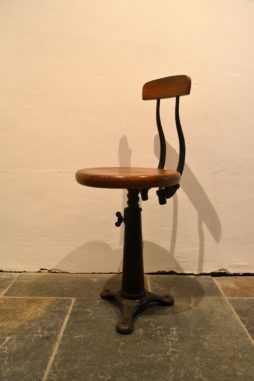 Many chairs like these don’t even have mounts on the back legs. I would date them to around the 1830-40’s. 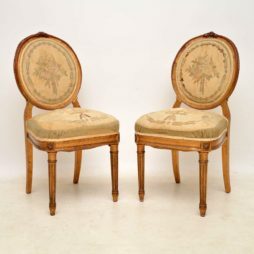 This pair of antique French gilt wood side chairs are in great shape, besides the original upholstery. 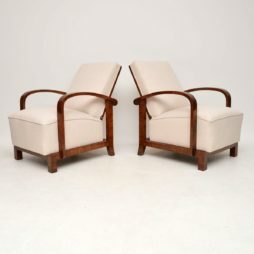 They are part of a whole set being sold on this site, including a sofa & matching pair of salons. 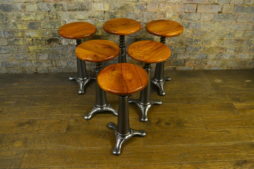 There is an image of the complete set below & they are also being shown separately on the site. I would rather sell it all together, but they are also available separately. They are all structurally sound & the gilt frames have naturally aged with the red layer underneath showing through. This all give them a great character look. 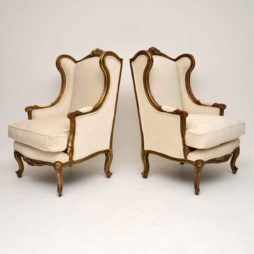 The carving is exquisite too & they sit on fluted legs. I would date them to around the 1850’s period, give or take 25 years. 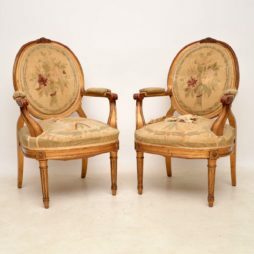 This pair of antique 19th century French gilt wood salon armchairs also have a matching sofa & pair of side chairs. The whole suite is showing in one of the images & you can also go to one of the other sub-categories to see the rest. 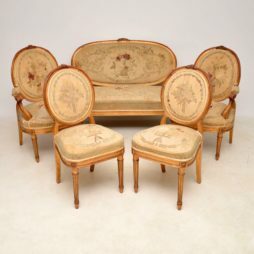 They are all in the same good original condition & I believe the upholstery is original too. 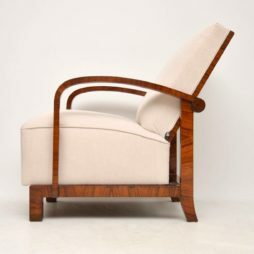 Having said that, it obviously needs to be re-upholstered & we can arrange that or sell as is. The gilding is naturally aged, so you can see a lot of the red undercoat coming through. I think this is a lovely feature & adds a lot to the character. 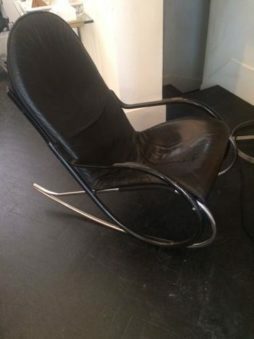 These chairs are excellent quality & structurally sound. 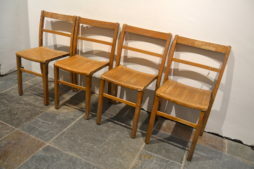 We would rather sell the whole set together, but they are priced & available separately. I would date them to around the 1850’s period, give or take 25 years. 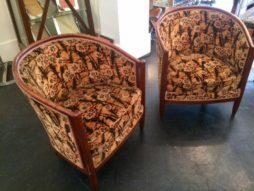 A stunning pair of tub chairs upholstered in Art Deco flowery motif velvet fabric and with legs elegantly fluted and tapered. 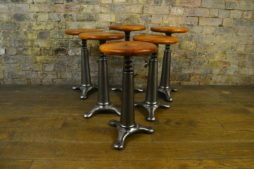 We have just purchased this amazing set of singer stools From a clothes factory in Scotland; the tops have been French polished and the metal has been cleaned up .These are very hard to find now especially in a set of six.